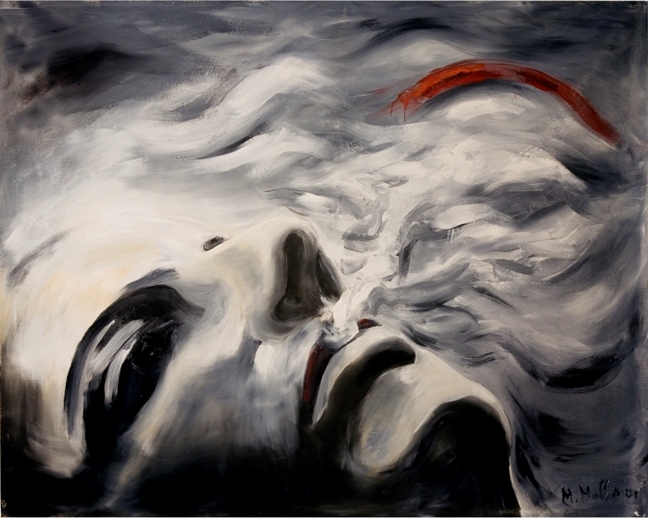 Hoffman’s Word is an arresting and arrested image of a breath. Breathing involves constant movement until death intervenes, but in a still image such as this the action of breathing is arrested mid-exhale. The significance of words is, in part, that they bring things into being. When this occurs it is known as performative utterance. We have an example of performative utterance in Genesis 1 where God says ‘Let there be’ and things come into being. Significant connections between word and breath are also made elsewhere in Scripture. For example the Scriptures themselves are described as being God-breathed (2 Timothy 3:16). This verse uses the Greek word theopneustos, which means ‘God-breathed, inspired by God, due to the inspiration of God.’ ‘Inspire’ comes from the Latin inspirare, which means to breath in. As a result, inspiration is not a fully accurate translation of theopneustos, as this word is about expiration rather than inspiration. Rather than breathing in inspired words, God speaks or breathes out his inspiration. Additionally we read that God breathed ‘the breath of life’ into Adam (Genesis 2:7) and that Jesus, the Word of God, breathed on his disciples at the point of their receiving his Holy Spirit’ (John 20:22). As a result we can see many connections between breath, inspiration and words. Inspiration is free just as breathing is free. Such freedom is vital as, when breathing becomes constrained, death quickly follows. Hoffman believes deeply in artistic creation as the one real margin of freedom we can use. He is concerned that our creativity is being used to construct ever more perfect and magnificent systems of control. Special tests and scales for measurement and classification of our intellect and emotions reduce us to filled forms in mysterious registers. Space for what is irrational, imperfect or disordered becomes increasingly narrow and freedom leaves us step by step. All that is free of supervision and beyond statistics and classifications is artistic creation; the only real margin of freedom we can use. On this basis Word is an image of free artistic creation, of the breath of life through the speech of performative utterance. ‘Let there be’, and being freely came into existence. Maciej Hoffman: Word, 2011, oil on canvas, 170 x 210 cm. Maciej Hoffman was born in Wroclaw, Poland. In his third year at the Theological Academy in Wroclaw, his craving for philosophy was no longer as powerful as the vocation to become an artist. In 1988 Hoffman enrolled in the Academy of Fine Arts, having graduated with a dual diploma in sculpture and painting. Hoffman went on to pursue a career in advertising and marketing. In 2003 he began exploring web art and became passionate for it. Today Hoffman has returned to exhibiting his artwork. His existential and expressionist work is concerned with the trauma of all individuals and peoples who have suffered - and continue to suffer - worldwide. Hoffman ‘views his art as both a means of self-expression and a way of engaging in public discourse, depicting contrasts, emotions and powerful human experiences.’ He has said that the subjects which interest him are those ‘issues that puzzle us throughout the years, forming our way of looking at the world, changing us.’ Maciej is a Polish Jew. He has frequently organised and contributed to inter-faith exhibitions/events. For more, see www.maciej-hoffman.com. Jonathan Evens is Priest-in-Charge at St Stephen Walbrook and Associate Vicar for Partnership Development at St Martin-in-the-Fields in London, England. A keen blogger he posts regularly on issues of faith and culture at http://joninbetween.blogspot.co.uk. His journalism and art criticism ranges from A.W.N. Pugin to U2 and has appeared in a range of publications, including Art & Christianity and the Church Times. He runs a visual arts organisation called commission4mission (c4m), which encourages churches to commission contemporary art and, together with the artist Henry Shelton, has published two collections of meditations and images on Christ's Passion. Together with the musician Peter Banks he has recently published a book on faith and music entitled The Secret Chord.